2.1.1 Epoxy Resin or Paint? 3 What is Epoxy Flooring? It’s no secret that most people’s garages not only just shelter their car. Many also double as a workshop, auto shop, and an oil change area too. The problem with this is a concrete garage floor is very hard to clean after oils and other substances have been spilled on it. It’s a hard surface to clean because concrete as a substance is always slightly porous. So when you get any liquid substance on your garage floor it actually soaks into the concrete a little. There is a solution though. That solution is to put an epoxy coating on your garage floor using the best garage floor paint. When you paint your garage floor with quality garage floor paint you create a smooth finish over your concrete surface that’s not porous. You then have a garage floor that’s much easier to clean and keep from staining. In this article, we will do a series of garage floor paint reviews and tell you more about garage floor paints and how to apply them. Here is a very durable garage floor paint from Supercoat. It’s a two-part waterborne epoxy that is breathable. That’s great because breathable epoxy paints cure harder than other types of paint. Because of that, this paint is tough enough to be applied even on the floors of heavy use garages. Just one gallon of this concrete floor paint covers over 200 square feet of flooring depending on how thick you apply it. 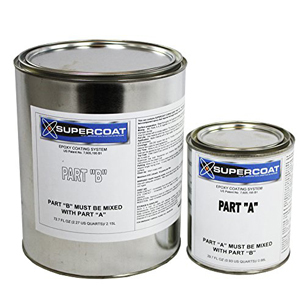 This Supercoat paint also comes in several different colors and the package includes garage floor cleaner/degreaser also. You can make your newly painted garage floor slip-resistant too by sprinkling the supplied aggregate crystals on the paint before it dries. For many years now Rust-Oleum has been a trusted name in paint manufacturing. Quality paints like this rugged garage floor paint are the reason why. 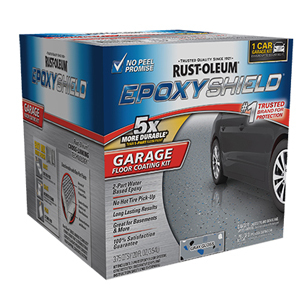 This 2-part epoxy formula paint will protect your newly painted garage floor against many different oils and chemicals. This includes gasoline, antifreeze, and motor oil. Not only does it protect well but this garage floor paint will also leave your garage floor with a nice looking semi-gloss grey finish. It takes just a single coat for this concrete paint to be applied effectively up to 500 square feet of garage floor. The finished paint is also ready to walk on in just 24 hours and it takes 3-days of curing before it can be driven on. 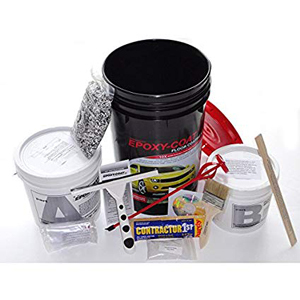 Here is a complete garage floor painting kit that takes the worry out of having to round up all of the supplies you need for your garage floor painting project. Epoxy-Coat also claims there epoxy paint is several times better than what you will buy at a home improvement center. As a matter of fact, their epoxy coating comes with a lifetime guarantee. This kit will have enough paint to cover and touch up a 500 square foot garage. This garage floor epoxy coating is made using 100% solids so it will not shrink up after it’s applied. It not only coats a garage floor as its thick enough to fill in some rough spots too. The kit includes 3 gallons of paint, roller, rags, paint stirrer, mixing bucket, cleaner, slip-resistant crystals, and a squeegee. Epoxy-Coat could not possibly have made painting a garage floor any simpler. Here is another 2-part epoxy garage floor paint that comes as part of a complete kit. It will leave a beautiful and durable grey epoxy finish on any concrete garage floor. 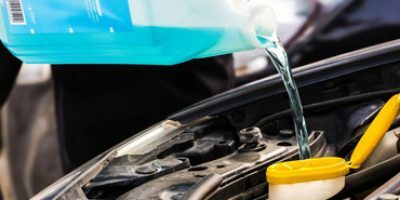 Once it has been applied, it will do an excellent job of protecting your garage floor from gasoline spills, dripping antifreeze, motor oils, and road salt. It will also not pull up when hot tires are driven over it. This is a single coat paint that will naturally fill in some rough spots too. The 3-gallons of paint that are included are enough to do a 600 square foot garage floor. This is a professional quality product that is far superior to most store-bought garage floor paints. This is a garage floor painting epoxy product that’s very comparable to what any professional garage floor painting company would use. It’s a 2-part epoxy resin coating that is made using 100% solids. That means it won’t crack or after it has been applied. This is a complete kit that will let you get started painting right away. The kit Coloredepoxies has come up with here includes everything you need to do your garage floor painting job. That includes cleaner, rags, roller and even protective gloves. Once this epoxy paint has cured it offers superior resistance to chemical and UV rays. That means it’s suitable for industrial, commercial and outdoor use. This 40-year old paint manufacturer has a reputation for making quality paints. Here they have come up with a 1-part epoxy garage floor paint that is functional and looks great once applied. It provides a good amount of resistance to oils, gasoline, and other chemicals and will not stain under normal conditions. Just one gallon of this product will cover almost 400 Square feet of garage floor. It’s a garage floor paint that goes on nicely over concrete and other masonry surfaces. 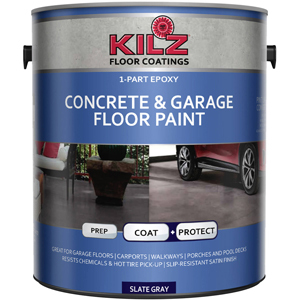 This Kilz paint product will not only protect your garage floor but will also leave it looking great with its new grey satin finish. Most epoxy garage floor paints would be termed to be more of a resin by professionals. That’s because they go on much thicker and are much more durable than regular epoxy paints. How do you spot an epoxy resin as opposed to regular epoxy paint? 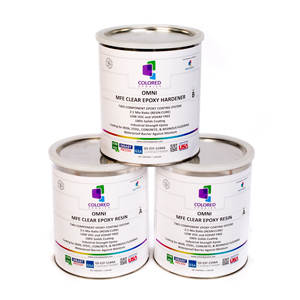 Most epoxy resin garage floor paints are made using 100% solid resins and contain no volatile organic compounds. Higher quality epoxy paints are also two-part formulas as opposed to others that are one-part epoxy paints. 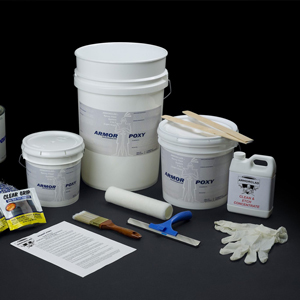 One-part epoxy paints are epoxy acrylics and not epoxy resins. Their advantage is that they are easier to clean up and they generally cover more area. If looks are your biggest concern, then epoxy acrylics are fine to use on your garage floor. So make sure you know which you are buying or you might end up dissatisfied with your finished paint job. Those who choose epoxy paints for their garage floor often choose them because of how well they adhere to their garage floor surface material. That does not mean, however, that they will stick to any type of garage floor surface. Most are made to go over finished concrete garage floors but some will also go over wood and other types of masonry. Make sure you look at the package or the manufacturer’s website to see what surfaces you can apply your new garage floor paint over. You absolutely must know the amount of garage floor coverage area you have to paint before shopping. This is so you know how much garage floor paint you need to purchase. It may seem like a ‘no brainer’ but a lot of people get this wrong and that could be disastrous if you run out of paint in the middle of the job. So check the approximate square foot coverage of the garage floor paint you are thinking about buying. Make sure you get enough epoxy paint to do the job plus about 20% extra for just in case. 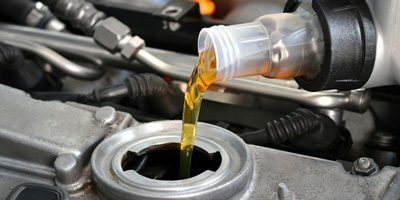 Unless you are a miracle worker, then chances are you will occasionally spill some oils, gas or other chemicals on your garage floor (see our power steering fluid reviews). That’s why you need an epoxy concrete paint that is tough and chemical resistant. 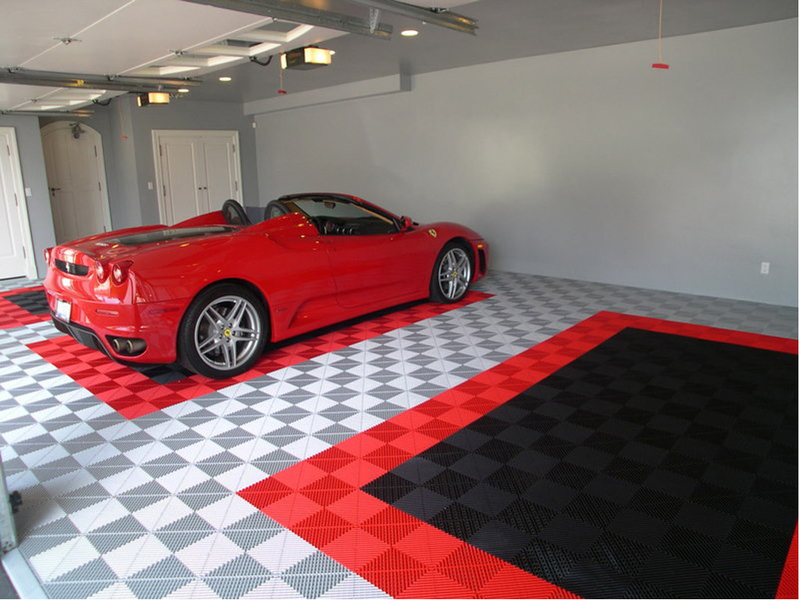 Most manufacturers will list what chemical their particular garage floor paint will resist. UV ray resistance, of course, is not important for indoor garage applications. On the other hand, if you are using your paint on a covered outside garage you better make sure it has good UV resistance. If not that epoxy paint will fade very quickly. You also need to know what type of finished look you want from your new garage floor paint job. Do you like the higher sheen of a semi-gloss or prefer more of a satin look. You do have choices so be sure to know what finish you will get with the paint you are buying. One of the main drawbacks of using epoxy paint is it can be slippery after it cures. As a general rule, the higher the shine of the finish the slipperier it is. So you may want to make sure you can add silicon crystals or other media to your newly applied paint to help make your new floor slip resistant. Even better yet if this non-slip media comes with your new epoxy paint. Things such as pot life and how your new epoxy paint is applied to your garage floor are big factors in how easy the job is to do. Epoxy resin paints tend to be much harder to apply because of their thickness and shorter pot life. So if you are looking for a quick and easy job, then maybe a 1-part epoxy is right for you. Drying time is usually not a big factor in most home garage paint applications. If you are, however, using this paint at an industrial or commercial site then it could be a big factor. Most manufacturers will give you drying times on the package of the garage floor paint you are thinking about buying. Some manufacturers have a lot of confidence in the quality and durability of their epoxy garage floor paint. These same manufacturers will often offer some sort of warranty on their product because of this. A few will be so confident in their product that they may even offer a lifetime warranty on it. So be sure to check and see if the concrete paint you are thinking about buying comes with a warranty. It may also be used as a determining factor when deciding between two different brands of paint that you like. This is just a little fancier term for 2-part epoxy resin paints. That’s because they go on so thick they are more like a garage floor coating than they are true paint. They can leave a finish that is 3x to 5x thicker than other types of garage floor paints. Epoxy floor coating is what professional garage floor painters always use. 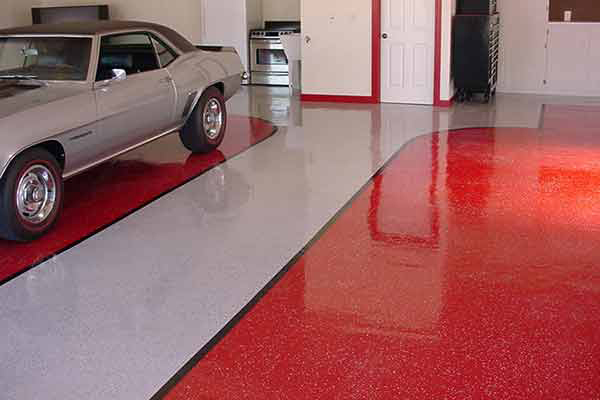 2-part epoxy resin paint – this is by far the most popular garage floor coating. As was mentioned above it is often referred to epoxy flooring as opposed to epoxy paint because of how thick it goes on. It is long lasting, durable and more expensive than the other type of epoxy garage floor paint. 1-part epoxy/acrylic paint – this is a much easier garage floor coating to work with than a 2-part epoxy resin is. That’s because this type of garage floor paint is not nearly as thick as 2-part epoxy resin paint. It’s a cheaper alternative than 2-part epoxy also. Garage epoxy flooring is much thicker and durable than garage paints are. You will not have to recoat your garage floor so often if you use thick epoxy flooring. 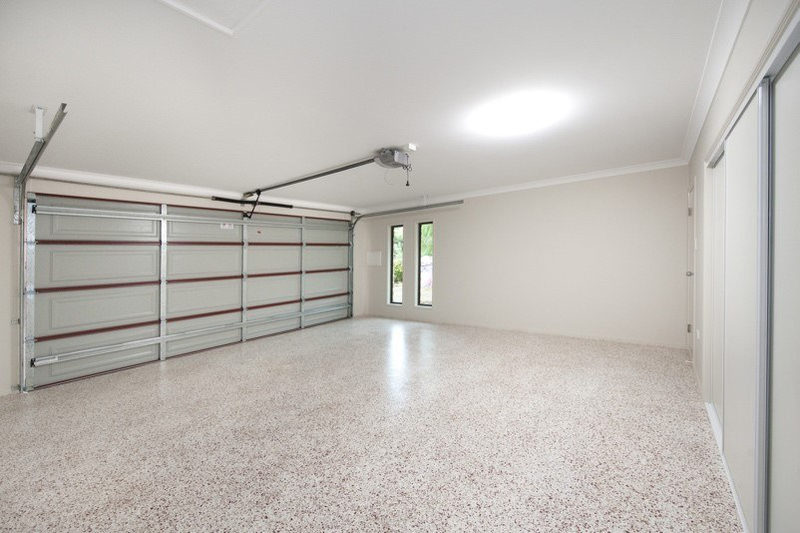 There are only two types of garage floor surfaces that we recommend you put epoxy paint over. One is if you have bare concrete that has never been painted. The other is if the existing garage floor was previously painted with epoxy paint and there is no area of the floor on the floor where the paint is peeling off. Step1: thoroughly sweep up all the dust and other dirt and debris off the garage floor. Step 2: Use a cleaner/degreaser. Getting one from the company that makes your garage floor paint is never a bad idea. TSP substitute will work well here too. Step 3: Follow the paint manufacturer’s instructions for acid etching the concrete. Acid etching greatly improves the ability of epoxy floor coatings to stick to concrete. As with any type of painting project, preparation is the key to a good looking and long lasting garage floor painting project. For regular garage floor paint, you can probably get by with some sort of paint stripper or other paint removal product. To remove old epoxy resin paint you will need a lot of physical labor to do it. Start by getting up as much paint as possible in areas that are peeling or coming up. Once this is done, use an orbital sander or floor buffer with an abrasive pad to get up the rest. Keep in mind you do not have to go down to the bare floor when removing epoxy paint. Once it’s smooth and no peeling spots remain, you can simply prime over it and then add a fresh layer of epoxy floor coating. OK, so now you are ready to get that garage floor nicely coated with the epoxy paint of your choice. Here is how we would proceed if we were doing. Step 1: Mix your pant up thoroughly. Make sure all of the thick, essential material on the bottom of your paint can is stirred very well into the paint. This is what gives your paint such things as its color and its adhesive properties. If you are using a two-part epoxy follow your directions to the letter. Make sure you never use 2-part epoxy paint until you have let the catalyst set up for as long as the manufacturer recommends. 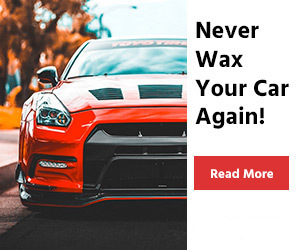 We also suggest that if you are using a 2-part epoxy resin paint that you never mix it all at once for a garage floor that is bigger than 250 square feet. As a general rule, only mix enough paint to do 250 square feet of garage floor at one time. If you do more than that it may harden too much and make it very hard or impossible to apply. Step 2: Quickly cut in the edge of your garage floor with a paintbrush. Make sure you apply the point so it covers from the wall to about 2” out from it. This will allow you to not have to get to close to the walls as you roll-on your new epoxy finish. Step 3: Work quickly in small sections at a time such as a 6’ x 6’ area. Do not work so fast that you spread the paint too thin. Make sure all of the concrete in each section is thoroughly coated with epoxy paint. Do the edge next to the section you will paint next last. This will ensure a nice even look across your whole garage floor when you are finished painting. Step 4: Add anti-slip material (Optional). This will most likely be silica sand or some other type of aggregate. Generally, this is just applied by sprinkling it evenly over the surface. Step 5: Coat a second time as necessary. If you added anti-slip material you will have to coat a second time or put down a protective clear top coating once the epoxy has thoroughly dried. Question: When you are ordering your epoxy garage floor paint should you order more than your estimated square footage needs? Answer: You pretty much just answered your own question. Your square footage calculation is an estimate. That’s why we recommend always allowing 20% more extra paint over what you have figured your coverage area to be. That’s because rough patches of concrete or other surface material can eat up more epoxy paint than normal. You also only have a limited amount of time to put on a second coat. That means you certainly don’t have time to order more paint if you ordered yours online. Question: Can you use a different brand of epoxy garage floor paint if you run out of the one you are using before the jobs finished? Answer: This is an absolute no-no. It could actually turn your garage floor painting project into a disaster. You never know how two different brands of epoxy paints will react to being mixed together. Question: My brother just put epoxy floor paint on his garage. It looks ok but not great. He told me the problem was how fast the 2-part epoxy paint started to dry in the container. I want to paint my garage floor too but I want it to look better than that; any suggestions? Answer: Whenever one of us works with epoxy paint we never mix all of what we need at once. For a project like a two car garage floor, you can mix ½ of the required amount of paint and then the other ½ and you should be fine. You will have a few hours to overlap the edge of the previously painted area with freshly mixed paint before it will impact the finished look. Question: Can you use epoxy garage floor paint immediately after it’s mixed? Answer: The answer here is no unless it’s a 1-part epoxy paint. For 2-part epoxy garage floor paint, the manufacturer’s instructions will tell you exactly how long you have to wait before using it. You are mixing in a catalyst and hardener and it takes time to fully take effect after it’s mixed into the epoxy base paint. Without a doubt, there is no better way to get a great looking garage floor than by painting it with quality epoxy paint. Not only will this leave your floor looking great but it will also make it chemical resistant and easier to clean up. So no longer will you have to worry about gas, oil and antifreeze spills when working on your vehicle in the comfort of your own garage. The best garage floor paint will really do that for you. The easiest way to pick good garage floor epoxy paint is to select one of the ones were on our garage floor paint reviews list. They are proven products that are highly rated by those that have used them. If you follow the advice in our buying guide and the other supplemental information that will help too. So consider this information and you will be well on your way to finding a garage floor paint that will work great for you.